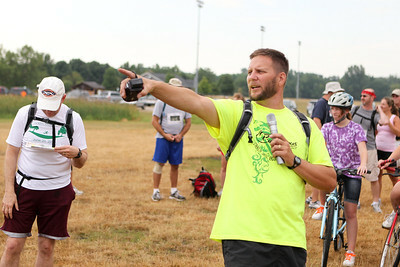 Mike Greene - mgreene@shawmedia.com Rundezvous Race creator Fred Kaiser, a gym teacher in Crystal Lake, explains the course to participants before the start of the race Saturday, July 14, 2012 at Lippold Park in Crystal Lake. The event, billed as a "frontier survival race," took participants on a 5-6 mile race with 14 events including archery, hatchet throwing, logging and more. 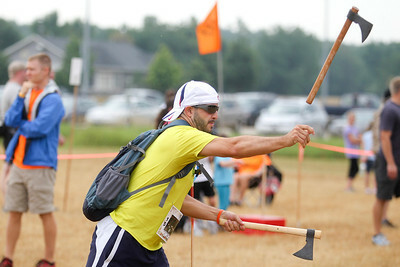 Mike Greene - mgreene@shawmedia.com Jay Bouker, of Antioch, practices throwing a hatchet before the start of the Rundezvous Race Saturday, July 14, 2012 at Lippold Park in Crystal Lake. The event, billed as a "frontier survival race," took participants on a 5-6 mile race with 14 events including archery, hatchet throwing, logging and more. Mike Greene - mgreene@shawmedia.com Russ Mocklinghoff gets his race badge punched after completing the knot portion of the Rundezvous Race Saturday, July 14, 2012 at Lippold Park in Crystal Lake. 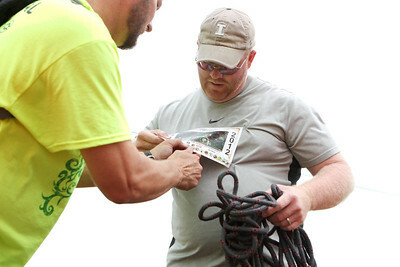 The event, billed as a "frontier survival race," took participants on a 5-6 mile race with 14 events including archery, hatchet throwing, logging and more. Mike Greene - mgreene@shawmedia.com Race creator Fred Kaiser (left) reviews knots made by Kevin Wensick, of Oakwood Hills, during the first portion of the Rundezvous Race Saturday, July 14, 2012 at Lippold Park in Crystal Lake. The event, billed as a "frontier survival race," took participants on a 5-6 mile race with 14 events including archery, hatchet throwing, logging and more. 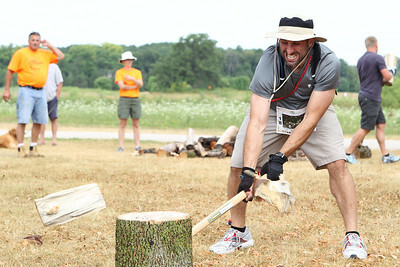 Mike Greene - mgreene@shawmedia.com Frank Grimaldi, of Elk Grove Village, chops a log in half while competing in the Rundezvous Race Saturday, July 14, 2012 at Lippold Park in Crystal Lake. The event, billed as a "frontier survival race," took participants on a 5-6 mile race with 14 events including archery, hatchet throwing, logging and more. Mike Greene - mgreene@shawmedia.com Participants take off at the start of the Rundezvous Race Saturday, July 14, 2012 at Lippold Park in Crystal Lake. The event, billed as a "frontier survival race," took participants on a 5-6 mile race with 14 events including archery, hatchet throwing, logging and more. 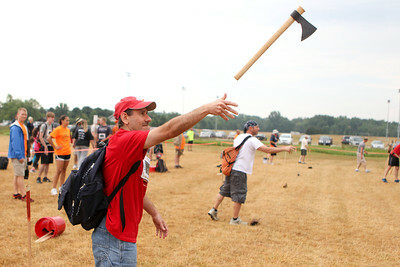 Mike Greene - mgreene@shawmedia.com Mike Murphy, of Wheaton, practices throwing a hatchet prior to the start of the Rundezvous Race Saturday, July 14, 2012 at Lippold Park in Crystal Lake. 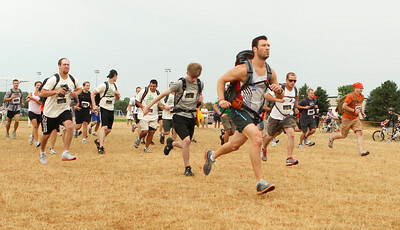 The event, billed as a "frontier survival race," was delayed due to inclemate weather but continued after the storms passed.